Here are some of the finest senior nutrition tips that will help you find the most beneficial foods for your body – without spending a fortune. To maintain a healthy lifestyle, you’ll need to understand the building blocks for a healthy diet. This brings us to our first point, nutrients. Typically, you’ll want your plate to look like a rainbow – you can never go wrong with bright colored foods. Your ideal healthy meal should consist of fruits and vegetables, lean protein, whole grains, and low-fat dairy. 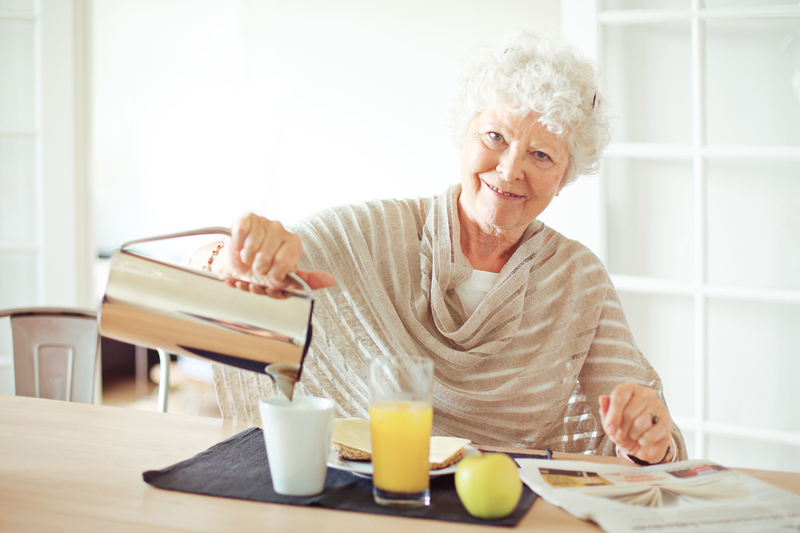 Remember: The best foods for optimal senior nutrition are usually low in sodium and high in fiber. Vitamin D is another important mineral that you should be wary of due to its’ ability to facilitate normal immune system function – great for when we age and perfect for optimizing senior nutrition. Whole foods are essentially the healthiest foods. These are typically scattered around the market, so you’ll have to be keen on what you’re exactly picking up to take home. Be sure to read the labels if you’re unsure. Some key terms to keep an eye out for include: low fat, added sugars, and sodium. You don’t need to be a neurosurgeon to understand that water in an important nutrient. Studies have shown that your individual water needs depend on a variety of factors including your current health, how physically active you are, and even where you live. There isn’t a single formula that applies to everyone, but knowing more about your body’s ‘thirst’ for fluids can give you a better idea of how much water you’ll need to drink each day. Note that these recommendations do include fluids from food, water, and other beverages. Be sure to keep fluids with salt and sugar at a minimum – unless your doctor provides you with a separate set of instructions. The best recipe for a healthy lifestyle is balancing health and fitness. Try and set a goal to be physically active for at least 30 minutes every day – even walking counts. For those that are currently inactive, it’s important that you do not jump into the fray but rather start with a few minutes of activity like walking. Gradually, as your body naturally becomes accustomed to this routine, and you start to become stronger, you can gravitate towards more physically-intensive routines like: jogging, partaking in yoga sessions, and even doing crunches – be careful not to push yourself too much. You’ll typically find that seniors are skeptical of any kind of change. In order to combat this, you’ll want to make small changes gradually. It’s understandable after all. Making dietary changes is a difficult task for anybody – especially for older adults. However, if you want to implement healthier changes and increase their well-being, there are specific things that you can to do help promote the change. One way you can go about doing this is to incorporate new foods gradually into their diet. For instance, if someone is diabetic and must adjust their carbohydrate intake, add some oatmeal once or twice per week. When we break it down, that’s 5 days of their habitual breakfast servings and only 2 days of what they might see as “boring oatmeal”. Another example would be substituting wheat bread instead of white the same way as we mentioned in the previous example – 5 days of white bread, 2 days of wheat bread. Over time, it’ll gradually increase so that new habits are formed, and the unhealthier options will be completely eliminated from their overall diet. The older you get, the more susceptible you are to chronic health problems such as high blood pressure, high cholesterol, osteoporosis, and more. It’s important that you follow up with your doctor and follow through with his or her senior nutrition dietary plan. Try not to stray too far from what your PCP suggests as your body may be sensitive to certain nutrients like processed sugars, saturated fats, and salts. If you’re having difficulty preparing food that’s rich in nutrients and attuned to your specific health conditions, talk to a trusted friend, family member, or your doctor. You can even take advantage of services like hiring a caregiver from A-1 Home Care Agency. We offer in-home care services and more for those living in Los Angeles, San Gabriel Valley or Orange County. Nonetheless, healthy eating becomes more important as you age. By consuming nutrient-rich, lower-calorie foods, you may help prevent or manage chronic health conditions. Lastly, it’ll help you feel more energized throughout the day, giving you the green light to enjoy what we like to call, “The Golden Years” of your life.